Kniha nabízí 500 doplňkových aktivit pro zpestření hodin angličtiny. Aktivity jsou určené nejen k procvičování, ale i pro aktivní komunikaci studentů a pro jejich pobavení. 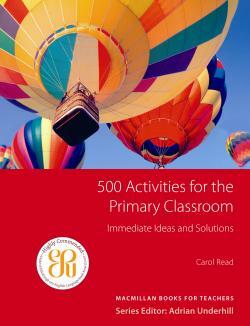 "500 Activities for the Primary Classroom" is the answer to that perennial question of "What on earth am I going to do with my class tomorrow?" Aimed at teachers of children between the ages of 3-12, this is a lively, varied compendium of ideas and classroom activities. Key features include: wide-ranging resource of activities which are easy to set up and do not require a lot of additional materials, and up-to-date approach that covers current approaches in teaching children including content-based learning. It is ideal for all primary-focused teachers, including those on teacher training courses such as the Cambridge CELTYL. It is designed to be flexible to supplement a wide range of syllabus-types (story-based, grammatical, etc.). • A wide-ranging resource of activities which are easy to set up and do not require a lot of additional materials. • Up-to-date approach covers current approaches in teaching children including content-based learning. • Ideal for all primary-focused teachers, including those on teacher training courses such as the Cambridge CELTYL. • Designed to be flexible to supplement a wide range of syllabus-types (story-based, grammatical, etc. ).